There’s no shortage of beer in Cleveland, that’s for sure. I had an inkling that this was true even before we moved to Cleveland. Soon after signing on the dotted line, Will Bush and I started searching for houses last spring. After long hours of touring homes, we met up with graduate students and post-doctoral fellows in Ohio City at the Market Garden Brewery. And I have been back several times since. The Market Garden Brewery is conveniently located next to the famous West Side Market. So if you are out and about grocery shopping or showing visitors around Cleveland, this is an no-brainer stop for lunch or dinner. This brewery opened in 2011, so it is not steeped in history like the nearby Great Lakes Brewery. But, the Brewery does offer distinct brews (Figure) and a nice menu mixed with shareables for happy hour and entrees for dinner. The Brewery also boasts to be a true beer garden, but we have yet to enjoy their patio. Sounds like one more thing to look forward to next time we are out and about this summer! Figure. 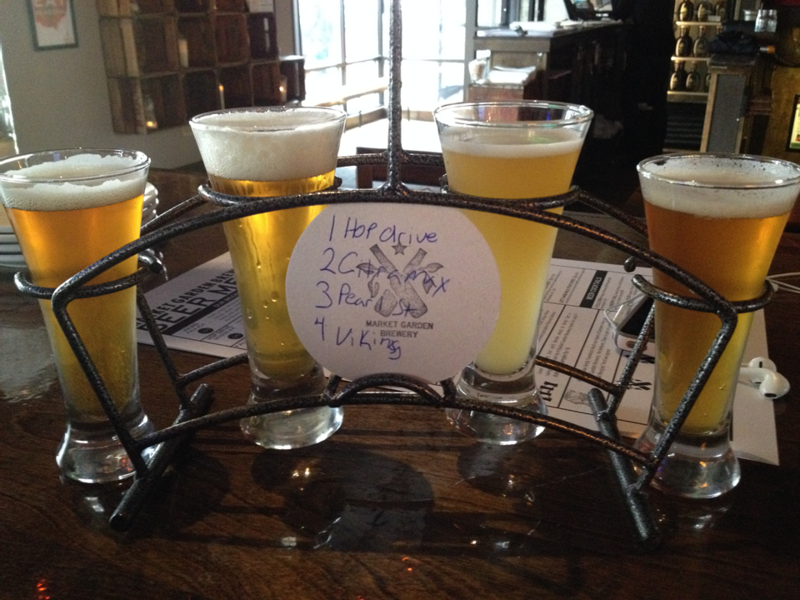 Market Garden Brewery sampler, October 2014. How fancy! Posted in Cleveland Calculus and tagged Beer, Ohio City.